Bronze jugs and drinking bowls, ca. 740 BCE, discovered in Tumulus MM, the Midas Mound. 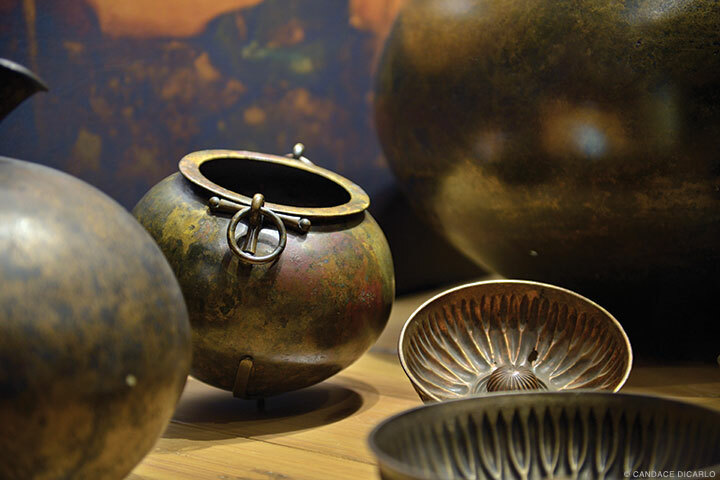 There’s a lot more to King Midas than history’s most celebrated case of “be careful what you wish for.” Drawing on decades of excavations at Gordion in modern Turkey, a blockbuster exhibition at the Penn Museum illuminates the world of ancient Phrygia’s greatest ruler. As king of Phrygia at the eighth-century BCE height of its power, Midas loomed large in the mythology of neighboring Greece and Rome. Or one might say that he loomed small—a popular figure of fun, mockingly enshrined centuries later as an exemplar of stupidity and cupidity in the Latin poet Ovid’s Metamorphoses. A case in point: Midas was reputed to have acquired donkey ears when he made the mistake of ruling for Pan rather than the more powerful Apollo in a musical contest. More famously, when Dionysus granted Midas’s ill-considered wish to have a “golden touch,” the king faced the threat of starvation from unexpectedly gilded food. But it turns out the myths don’t do Midas justice. His contemporary Assyrian rivals, whose writings are the principal historical sources on his reign, had a more respectful, if wary, view of the man they called Mita. Their annals describe him first as a foe, fomenting insurrection in the Assyrian-controlled states bordering his kingdom, and later as an important ally. 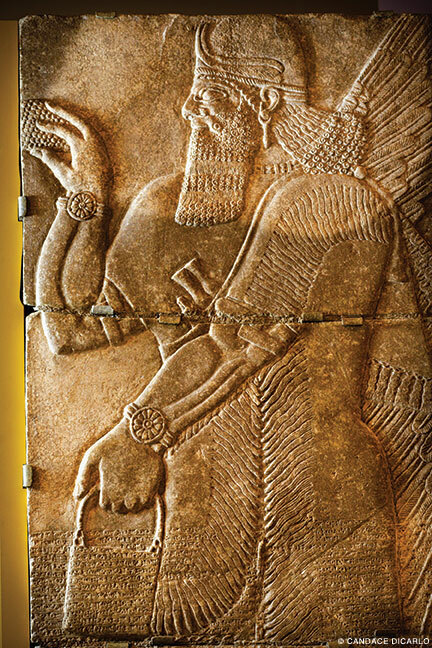 “They were exasperated by him, they feared him, and in the end Midas established diplomatic relations with Assyria, so they liked him,” says C. Brian Rose, curator of the Penn Museum of Archaeology and Anthropology’s world-exclusive exhibition, The Golden Age of King Midas. Large cauldron with siren and demon attachments—probably intended to inspire awe and offer protection to the deceased—used to store liquids for the funerary feast. The show, on view through November 27, capitalizes on the myths and speculates on their origin. But it also presents considerable archaeological evidence from the ancient capital of Gordion, about 40 miles southwest of Ankara in modern Turkey, of the king’s energy and ambition. Its centerpiece is a gallery designed to suggest the earth-covered wooden tomb Midas constructed around 740 BCE for his father, Gordios—a burial mound that, at 174 feet, remained the most imposing such monument in Asia Minor for nearly two centuries. 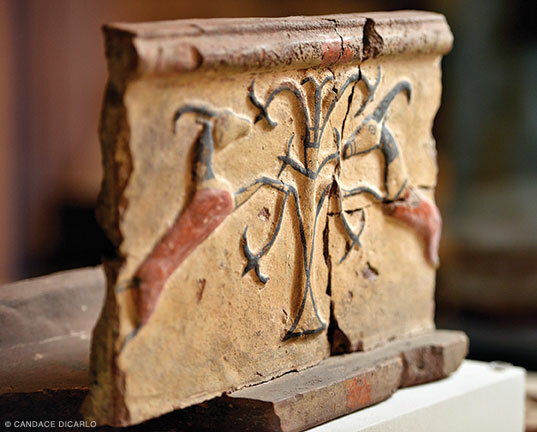 To the delight of Penn’s excavators, the royal tomb was found intact in 1957. 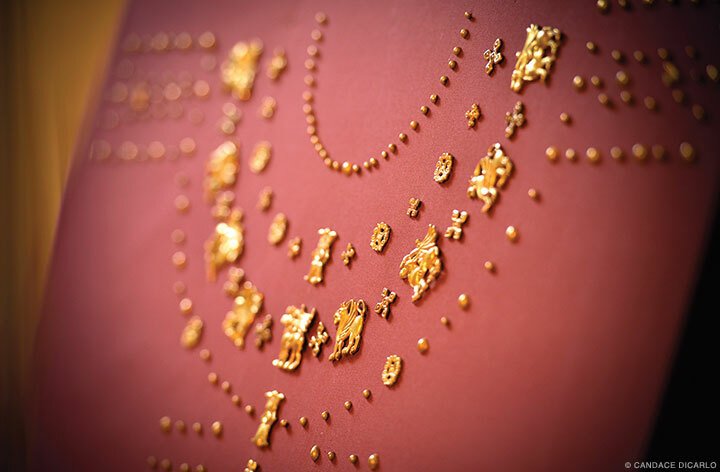 Within the so-called Midas Mound lay a skeleton, fragments of a gold-colored shroud, and hundreds of wooden and bronze objects, including finely wrought vessels still containing the remnants of a funerary feast. With 230 artifacts in all, The Golden Age of King Midas invites contemplation of Midas’s power, the mutability of reputation, the long-term commitment of Penn to this rich Turkish site—and the ability of archaeology to re-create, in imaginatively stirring ways, an otherwise inaccessible past. “We regard the exhibit—indeed all our exhibits at the Penn Museum—as the public performance of our research,” says Rose, the James B. Pritchard Professor of Archaeology, the Peter C. Ferry Curator-in-Charge of the museum’s Mediterranean Section, and director of the Gordion Archaeological Project. 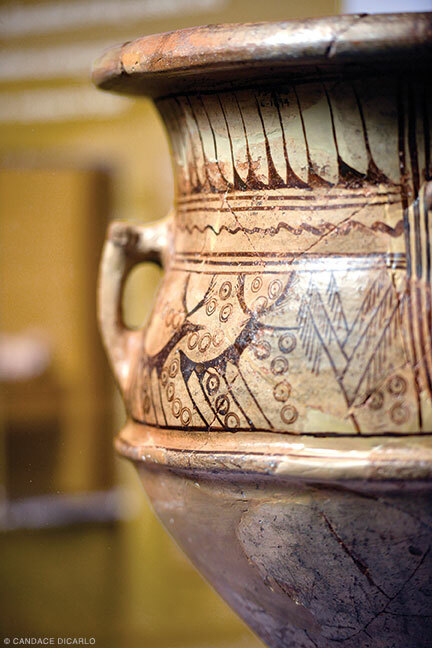 Launched in 1950, the Gordion excavations constitute the museum’s largest and longest-running archaeological enterprise. Rose says he began his efforts to mount this exhibition in 2008, with the idea of a 60th anniversary show in 2010, but “underestimated the amount of time that was necessary to put a show this ambitious together.” One major hurdle that had to be overcome was a dispute over whether certain gold artifacts in the museum’s collection may have had Turkish origins, which delayed the signing of an enabling agreement with the Turkish government until 2012. 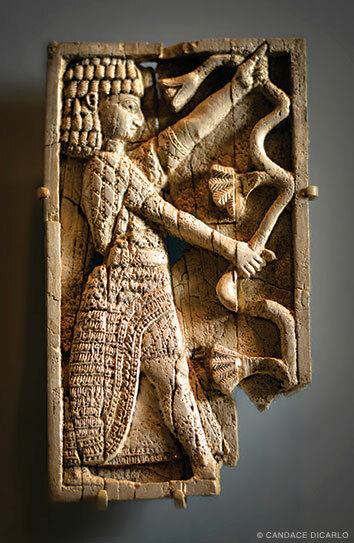 Ivory furniture plaque, eighth century BCE, probably used to decorate a chair or couch. In historical sources, Gordion was known not only for Midas’s more than four decades of empire-building, but also as the city where Alexander the Great, in 333 BCE, cut through the tangled “Gordian Knot” to fulfill a Delphic prophecy about the conquest of Asia. Over time, the city’s location “had been lost to memory,” says the Penn Museum’s Gordion archivist, Gareth Darbyshire. It was (accidentally) re-discovered in 1892, when a team building a branch of a Berlin-Baghdad railway encountered a cluster of man-made mounds in and around Turkey’s Sakarya Valley. The workers “actually robbed the site to create building materials for construction of the railway,” adds Darbyshire, an archaeologist whose responsibilities include managing and overseeing the digitization of thousands of photographs, journals, drawings, and other materials documenting Gordion. His knowledge of the site is, as one might expect, encyclopedic, and it pours out in dense, rapid-fire paragraphs delivered in a lilting northern English accent. The pillaging, Darbyshire says, is evident in underpasses, viaducts, and other parts of the railway comprised of “unmistakable polychromatic ashlar blocks characteristic of the Middle Phrygian period,” from 800 to 600 BCE. “The engineers were using Gordion as a quarry,” he says. The materials came from what archaeologists call the Citadel Mound, within which lay traces of Iron Age Phrygia’s impressive administrative and industrial center. A limestone relief, 883-859 BCE, depicting a winged genie, that decorated a room in the palace of the Syrian ruler Ashurnasirpal II, both from Nimrud, Iraq. Fortunately, those German railroad engineers decided to contact Alfred Körte, a classical philologist in Berlin. “He was steeped in the ancient written sources, so he must almost immediately have come to Gordion to look,” Darbyshire says. The location, the monumentality of the site, and the presence of “well over 100 elite tumuli,” or burial mounds, helped him identify the place. In 1900, Körte, whose area of expertise was actually ancient Greek comedies, returned to Turkey with his archaeologist brother, Gustav. They spent a single season digging, establishing the chronology of the Citadel Mound (Gordion was inhabited continuously starting around 2300 BCE) and excavating five tumuli. “They didn’t tackle the biggest one”—Tumulus MM, the Midas Mound—“because they knew it was just too difficult logistically or highly dangerous,” Darbyshire says. After that, work on the site didn’t resume until after World War II. In the late 1940s, Penn was looking for a major archaeological mission in Turkey, Darbyshire says, and scouted various possibilities. Among them was Sardis, the capital of the Lydian kingdom in what is now western Turkey, whose best known ruler was Croesus (as in “rich as…”). But Gordion was chosen for its historical interest, potential, and accessibility. Since there had been no previous significant excavation of Phrygian sites, “the world of the Phrygians was still a great mystery,” Darbyshire explains. And because Gordion was not “masked by a major modern settlement,” archaeologists would have free rein to dig. Penn’s first team, led by the archaeologist Rodney Young, excavated for 17 seasons between 1950 and 1973, uncovering much of the eastern half of the Citadel Mound and 30 burial mounds. A second set of digs, directed by Mary Voigt, took place between 1988 and 2006. Summer excavations supervised by Rose began in 2013 and continue in tandem with site conservation and surveying. Only once before the current show, in 1958, has a display of artifacts from Gordion been mounted at Penn, Darbyshire says. 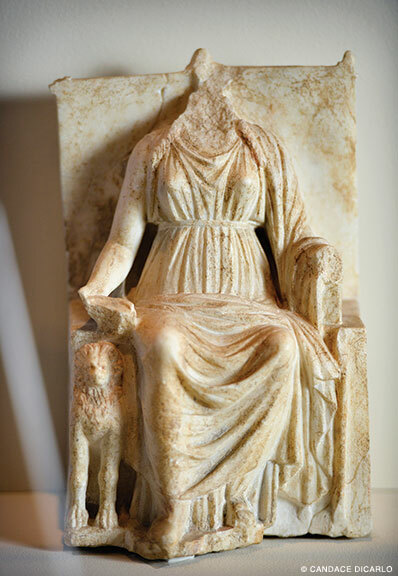 Marble statuette of seated Cybele (the Mother Goddess), late third-early second century BCE, probably from a domestic shrine, found in a private house in Gordion. In the early 20th century, artifacts found by archaeologists generally were allocated by partage—a sharing between the sponsoring institution or institutions and the source country. Without partage, museums such as Penn’s could not have accumulated their great collections. But, Rose says, beginning in the 1930s, national cultural-heritage laws began mandating that excavated antiquities remain in their country of origin. Painted terracotta plaque, of a type believed invented in Phrygia, sixth century BCE, found in the Citadel Mound. Given the likelihood that the gold was Trojan, Turkey wanted the jewelry back. In the end, a deal was struck, Rose says: Penn consented to an “indefinite loan” of the jewelry to Turkey, and Turkey agreed to lend Penn 123 artifacts from Gordion and related sites for the Midas exhibition. Gold appliques, fifth century BCE, found in a tomb in the region of Maikop, in southwestern Russia. They would have been sewn onto a shroud. Alongside Young’s image, a film clip shows his team constructing a tunnel to penetrate the massive burial mound. About 230 feet long, the tunnel was dug by coal miners from a Black Sea town, Rose says. They worked in shifts around the clock for three weeks so looters could not access the site. 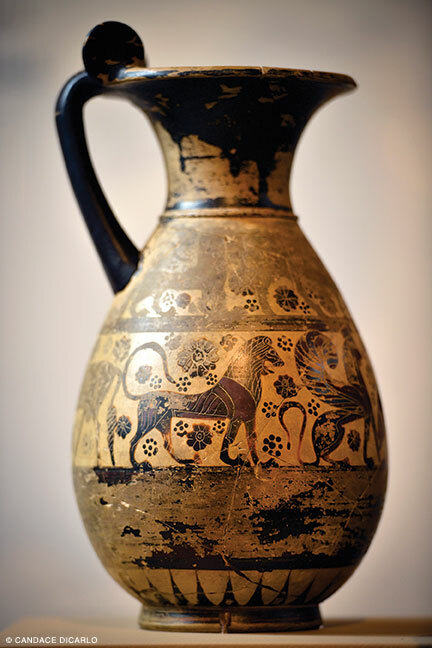 Ceramic wine pitcher, 620-590 BCE, from the Mediterranean islands, representative of the “Orientalizing” style of Greek pottery. The tomb chamber measured about 17 by 20 feet, with a nearly 11-foot-high ceiling; it had a cedar floor, walls of pine, and outer walls of juniper. It had been closed up—with rubble, limestone, dirt, and clay—after the coffin and grave goods were lowered inside. 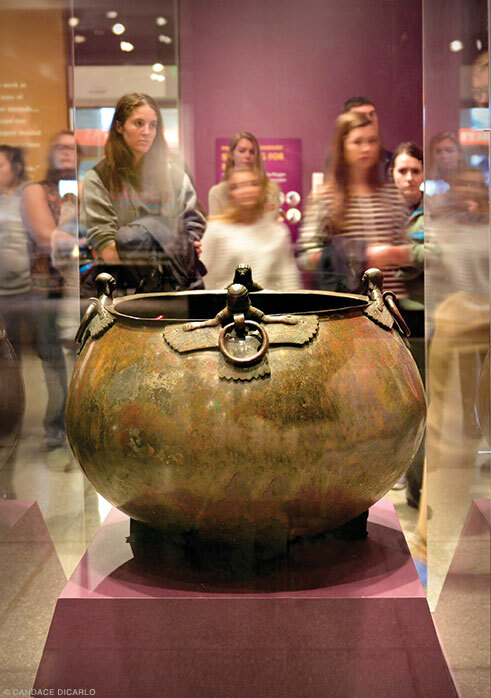 Among those goods, from a funerary feast for more than 100, were three giant cauldrons decorated with small figurines and 167 bronze bowls, ladles, and pitchers. Some of the bowls, Rose says, had wax rectangles added to their sides where mourners had inscribed their names. Also found were 182 bronze fibulae, or garment pins, many likely left by the mourners as gifts; several bronze belts; and 14 wooden serving and dining tables, too fragile to travel to Philadelphia. 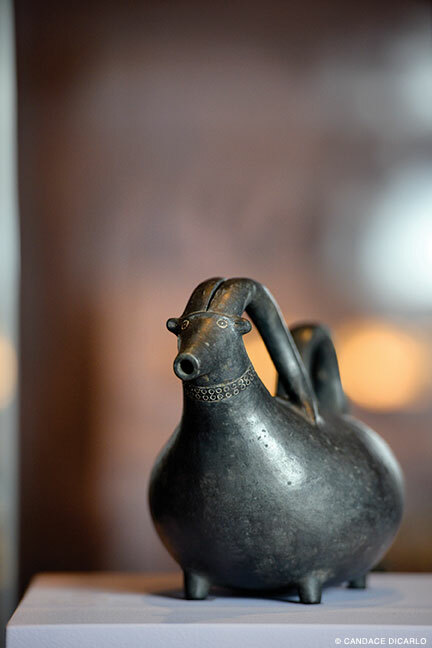 Black polished goat jug, 770-760 BCE, one of several animal-shaped ceramic vessels found in Tumulus P at Gordion. Young thought he had uncovered the tomb of Midas himself. But dendrochronology (tree-ring dating) and radiocarbon dating eventually indicated that its construction was several decades too early. Its size and splendor nevertheless marked it as royal, almost certainly the resting place of Midas’s father. An interactive display shows visitors what the tomb chamber looked like when it was discovered. Nearby are two of the hefty cauldrons (and a replica of the third), several beautiful bronze vessels and fibulae—and a plaster reconstruction of the dead king’s head. When the reconstruction was done, in the 1970s, the king—aged 60 to 65—was still assumed to have been Midas. The Roman writer Strabo claimed that the despairing monarch had committed suicide by drinking bull’s blood after marauders from Southwest Russia invaded his kingdom. 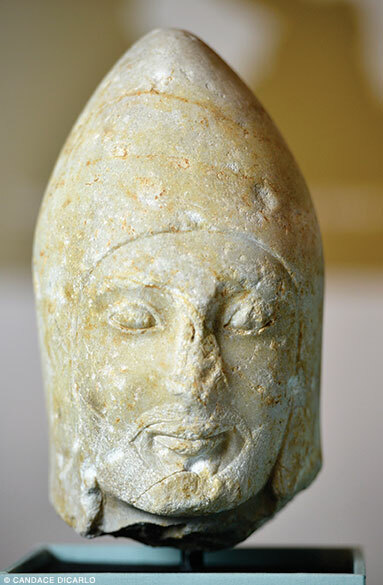 Marble Persian head with tiara (symbol of power and sovereignty), late sixth-early fifth century BCE. In fact, just one gold necklace from a Gordion burial is displayed, since little gold was found at the site. But the exhibition glitters with gold from neighboring lands: Persian coins, Lydian jewelry, Scythian shroud decorations. And one glass display-case is filled with silver from a late eighth-century BCE tomb, a woman’s burial in Bayindir, in an area known as Lycia in southwest Turkey. Alongside bowls and fibulae in Phrygian styles and a high-hatted statue of a priest is a silver belt with a filigree buckle and embossed geometric patterns. Every archaeological supervisor at Gordion has kept excavation-trench diaries; there are more than 200 in all. 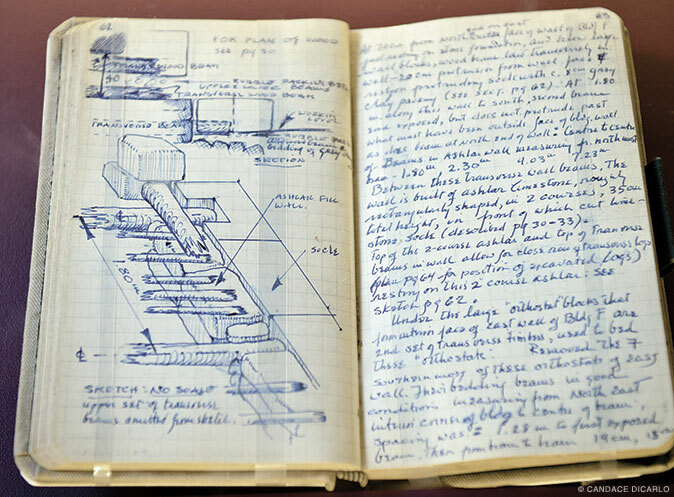 These pages, written on April 30, 1961, document excavations of the Citadel Mound, including a sketch of one of the buildings being uncovered. The Phrygians’ predilection for geometric patterning is reflected throughout their material culture: in ceramic drinking vessels, textiles, painted terracotta tiles, and a remarkable ninth-century BCE colored pebble mosaic—the oldest known example of its type. The terracotta and ceramics also sport figural motifs, usually of animals; one tile may portray Theseus confronting the Minotaur in the labyrinth at Crete. 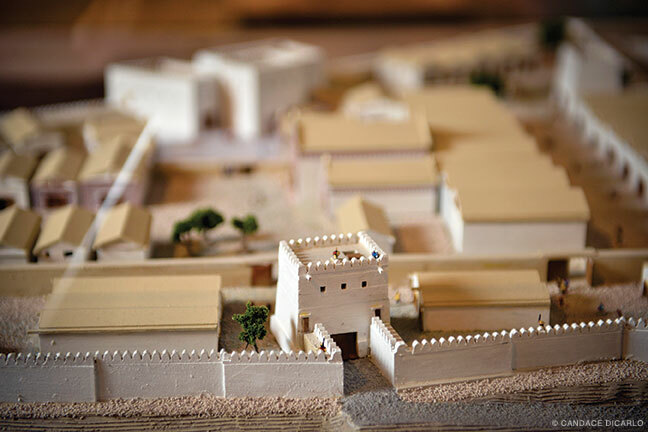 A model shows what the eastern part of the Early Phrygian (pre-Midas) citadel at Gordion might have looked like before a destructive fire in 800 BCE. 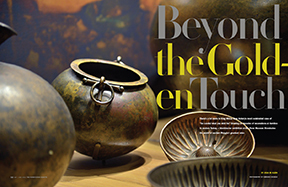 The Golden Age of Midas introduces visitors to lingering, and surprising, traces of Phrygia in our own culture. The Phrygian mode of music, as described by Greek and Roman sources, was an antecedent of flamenco and has echoes in the tunes of Metallica and Santana, Rose says. The slouchy, conical Phrygian cap, perhaps confused with a similar cap worn by freed Roman slaves, became associated with liberty in both France and the United States, and still adorns the US Senate seal. The exhibition also situates Phrygia in historical and geographic context. A timeline, moving backward from the present, is punctuated by Persian and Roman coins and a third century CE papyrus fragment of Homer’s Iliad, which was probably first written down during Midas’s reign. The Phrygians figured in the epic as Trojan allies—not surprising, since Priam’s wife, Hecuba, was Phrygian. Yet Midas himself was apparently partial to the Greeks. In the fifth century BCE, Herodotus described him as the first foreign king to have made a dedication to the sanctuary of Apollo at Delphi. The object he dedicated was a wood and ivory throne. On exhibit is an ivory furniture attachment from the late eighth century BCE that depicts a man beside a standing lion. A loan from Greece that was found at Delphi, “it almost certainly would have been part of that throne,” Rose says. A section of the exhibition uses rarely seen artifacts from Penn’s own collections to introduce Phrygia’s neighbors, allies, and competitors. Highlights include a bronze helmet fragment from Urartu, to the east; gold necklaces and earrings from wealthy Lydia, to the west; Phrygian-influenced ceramics from Greece; intricate ivory carvings from Assyria; and a Persian vessel celebrating “Xerxes the Great King” in four languages. “Midas was distinctive in that he was reaching out to the powers that lay at both east and west as no other Near Eastern king was doing in those days,” Rose explains. But his reign marked the acme of Phrygian influence: The Lydians would overrun Phrygia in the late seventh century BCE, while the Persians conquered Asia Minor in 546 BCE. A sampling of the arrowheads they used in besieging Gordion is on display. Ceramic krater, ninth-eighth century BCE; its distinctive painted decoration was rare in Gordion. Surely, though, the real archaeological prize at Gordion is Midas’s elusive tomb? So far, only 44 of the 124 tumuli at Gordion have been excavated, leaving many discoveries yet to be made. “Would I like to find it? I would,” says Rose, who has clearly been asked this question many times before. “Do I know where it is? I don’t. Is it something that archaeologists of the future will determine? I suspect it is. “If I ask myself where would such a tomb be, where would I put it, I would put it next to the tomb of the father, I would make it a dynastic grouping of tombs. Julia M. Klein, a cultural reporter and critic in Philadelphia, is a contributing editor at Columbia Journalism Review and a contributing book critic for the Forward. Her last piece for the Gazette was on Kermit Roosevelt III. Follow her on Twitter @JuliaMKlein. Its sad that almost all of the statuettes of women had their faces bashed in by men of the rising male cults of the patriarch between 2nd century bce and the 1st century ce. Including the Cybele (the Mother Goddess).